Ideas • Ask your child to say what number is showing on the ‘top’ of the dice, and if they are unsure they can count the dots to check. • Choose an action, like jumping or waving or saying ‘bong’, and do it a many times as the number on the dice. • Hold up the number of fingers to match the number on the dice. • Find a numeral somewhere in the room to match the number on the dice. • Count how many times you have to click the dice before it comes up with the same number twice in a row. • Guess: what will the next number be? • Predict: will the next number be bigger, smaller or the same as the current number? Are there any numbers you can be sure the next number won’t be bigger or smaller than? Any numbers you expect the next number won’t be bigger or smaller than? The Hover Dice On the screen The Hover Dice gives children an on-screen equivalent to a physical dice. 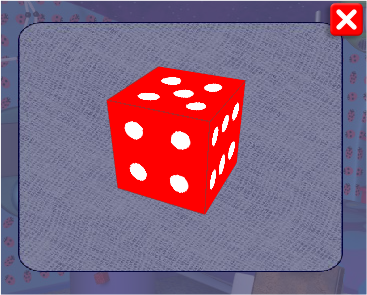 Click on the Hover Dice to make it roll.